I do believe that at some point government has borrowed enough. 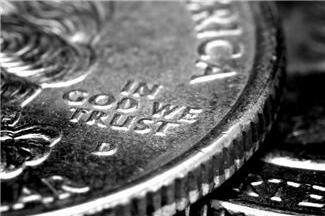 Although tax revenue is directly tied to economic growth, government spending is not. How does one balance a budget? Let me count the ways. Spend less than you take in annually, and you’ll live within your means. But how can governments comply? Why that’s easy. Simply calculate the rate of revenue growth in the previous year, then adjust the prior year’s spending level by this multiple for the current year. If a deficit ensues, trim spending back into balance. If a surplus results, pass it back to taxpayers in the form of tax rate reductions. Most of us would call this a balanced approach. Of course proponents of big-government will retort, “It doesn’t work like that. We must spend around 50% or more than we take in, to stimulate revenue; so that we can spend around 50% more than we take in, to stimulate even more revenue; so that we can spend around 50% more than we take in, stimulating ever more revenue, ad infinitum…” Yet, it’s rather obvious that the modern day extreme left-wing’s touted correlation between government borrowing and economic growth is nonexistent, as we proved in – Uncorrelated: GDP and National Debt. It might be helpful for far left-wingers to remember the words of the Original Democrat, Andrew Jackson, who once said, “I am one of those who do not believe that a national debt is a national blessing, but rather a curse to a republic; inasmuch as it is calculated to raise around the administration a moneyed aristocracy dangerous to the liberties of the country.” For more, see my post entitled, From AAA to AA- in Four Years. You see, “For Jackson politics was very personal,” says H.W. Brands, an Andrew Jackson biographer at the University of Texas. “He hated not just the federal debt. He hated debt at all.” Before he was president, Jackson was a land speculator in Tennessee. He learned to hate debt when a land deal went bad and left him with massive debt and some worthless paper notes. Thus, unlike POTUS #44, Jackson brought practical business experience to the White House. When he ran for president, Jackson knew his enemy: banks and the national debt. He called it “the national curse”. In Jackson’s mind, debt was “a moral failing”, says Brands. “The idea you could somehow acquire stuff through debt almost seemed like black magic.” But now days, if you listen closely to the Democratic Party, its enemy is no longer the national debt, but rather the average, anti-debt, fiscally responsible, Tea Party patriot. 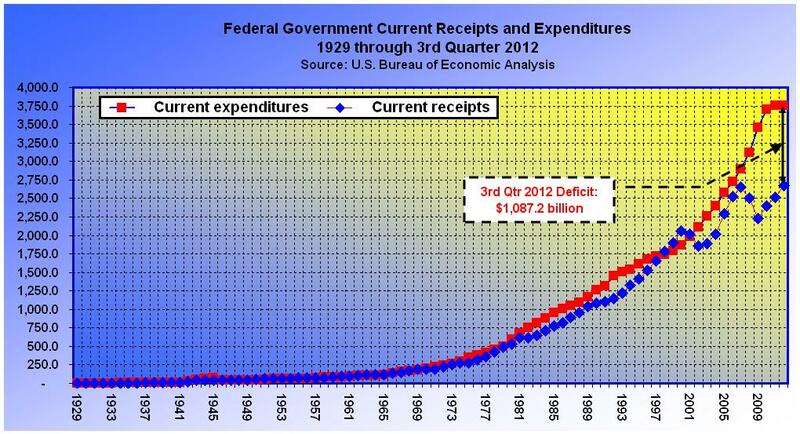 What would the federal government’s surpluses and deficits look like had it followed a balanced approach since 1929? Per the chart below, having begun with a surplus of $1 billion in 1929, the federal government would have realized a surplus of $835 billion in the 3rd quarter of 2012, compared to an actual deficit of around $1.1 trillion. Of course, all surpluses along the way could have been returned to taxpayers through periodic tax rate reductions, making income tax compliance at least somewhat worthy of the effort. Under the balanced approach, when all spending is totaled from 1929 through 2012, the federal government would have spent a total of $39.4 trillion, versus the $66.9 trillion actually spent, for savings of $27.5 trillion. That means instead of a national debt fast approaching $17 trillion, we could be sitting on a national surplus of around $10.5 trillion. In contrast, what has the federal government’s unbalanced approach yielded? 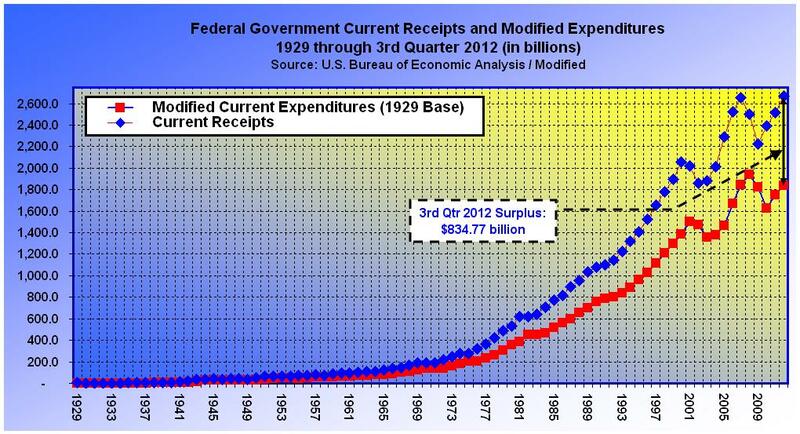 Per the second chart (below), having begun with a surplus of $1 billion in 1929, the federal government wound up running a budget deficit of approximately $1.1 trillion in the 3rd quarter of 2012. As you can see, the main imbalance has occurred since the year 2008, which is when the federal government adopted its current philosophy, where expenditures are completely decoupled from revenue growth – as if spending is suddenly a function of an imaginary 22nd Century economic boom. Meanwhile, approximately $6.7 trillion has been added to the debt since 2008, and the economy grew at a paltry annual rate of 0.4% (revised) in the 4th Quarter of 2012. Although federal tax revenue is a function of economic growth, government spending is not. In other words, as the economy grows, tax revenue increases; and as it shrinks, tax revenue declines. Anyone who doesn’t understand this should return to the 6th grade for a refresher in basic math. On the other hand, government spending is a function of revenue. That is to say, as tax revenue rises and falls, so follows the amount available for government expenditures. Surpluses and deficits are directly linked to the level of government spending. When government spends less than it takes in, there is a surplus; when it spends more than it takes in, a deficit. It’s really that simple. If the federal government is to ever regain control over spending, it must start with the rate of revenue increase (or decrease) in the previous year, since this is the only reasonable way of projecting the amount available for the current year, and then adjust its current year spending level accordingly (up or down). As soon as a deficit appears, the role of government is to trim spending back into balance. When a surplus results, government’s role is to pass the savings back to taxpayers, in the form of tax rate reductions. This we call, “the balanced approach” – and there is none other. Don’t patronize me. There is really only one question, Will the Democratic Party ever recover its bygone common sense? ← What Does Sequestration Mean To You?